Click here to read Part I about the Central Coast and Southern California. This week’s article covers the Great Central Valley. 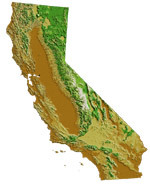 The adjoining San Joaquin and Sacramento Valleys form the Great Central Valley, which stretches over 450 miles from the Tehachapi Mountains in the south to the Cascade Range in the north. This basin, once the floor of an inland sea, lies between the Coast Ranges and the Sierra Nevada Mountains. The Central Valley is one of the most productive regions on Earth, and its inhabitants have long been sustained by its bounty. Several Native American tribes, including the Miwok, Yokut, Wintun, Maidu, and Monache were supplied with roots, seeds, nuts and berries, deer, rabbit, salmon and other fish from the region. The San Joaquin Plain was then all but empty, below it laying the swampland of the Tulare Lake and Basin, while the Sacramento Valley encompassed riparian woodland, prairie, and marshes. Today, the valley, which provides America with over 25% of everything we eat, is dramatically changed – almost entirely a patchwork of farms and, increasingly, urban and suburban developments. Since its beginning, farming in the Central Valley has been characterized by innovation. New technologies and practices developed there have set trends for agriculture in the United States and the world. In the early 1850s, many miners gave up on gold and began growing wheat on large tracts of land in the valley, and wheat production quickly grew into a large industry. Farmers developed new machinery, varieties, and techniques that were highly productive, and because of California’s unique climate, distinctly different from wheat production in Eastern states. But hot and dry summers, cool, wet winters and rich soil, coupled with a 300-day growing season quickly proved ideal for much more than the production of wheat. 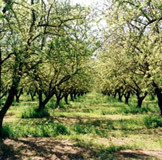 In the Reedley area near Fresno, from which over half of the stone fruit producers that sell at the Ferry Plaza Farmers Market come, wheat production dominated until the late 1800s, when demand from eastern markets, newly developed shipping infrastructure (namely the Transcontinental Railroad), irrigation improvements, and declining wheat prices led farmers to begin cultivating plums and peaches. Reedley is now home to the largest plum and nectarine growers in the world and its story typifies the intensification of farming that has occurred in many parts of the valley over the past 100 years. Today, the San Joaquin Valley grows cotton, grapes, olives, potatoes, stone fruit, Asian vegetables, nuts, citrus, and berries. Out of the Sacramento Valley come rice, beans, row crops, fruits, cattle, corn, and grapes. Innovations in irrigation, mechanization, labor structure, plant breeding, and inputs such as pesticides and fertilizers, as well as two major water projects (state and federal) have enabled this intensification. Corporations that hold large plots of land and concentrate on just one or two crops now produce over half of the valley’s food. Despite the amazing productivity of agriculture in the Central Valley, there are significant problems with the kind of farming that currently prevails there. Industrial agriculture has caused soil erosion and salinization, land subsidence from groundwater pumping, economic disparity, and the disappearance of family farms. But there is hope for a more sustainable agricultural future. From throughout the Great Central Valley to the Ferry Plaza Farmers Market come stone fruits, nuts, apples, vegetables, olives, meat and poultry, citrus, berries, and a range of row crops. The type and scale of farming practiced by the farmers that come to our market is distinctly different from what predominates in the valley. These farmers understand that the industrial model has pushed ecological, social, and economic limits to a place that cannot be sustained, and in the traditional spirit of the region, are innovating. From their agricultural techniques, to their treatment of workers, to their distribution and business models, farmers are running their farms in a way that many might say is intuitive - they are enriching their soils, nourishing their families, and making better money by selling their products directly to consumers.